Old electronics are a great deal, when it comes to eradicating them. This is also a problem that every one of us has old electronics appliances or gadgets. Therefore, people should opt for the solution that will lead to successful eradication of the old electronics. However, the question arise is what is the solution for eradicating old electronics. The solution is often opting for the recycling procedure, which can do host of good for the society. Recycling of old electronics is also good for environment, good for humans, good for animals, good for birds, good for trees, good for reduced pollution, and good for overall exosphere. Where to recycle old electronics is the next question that bothers people. There are companies like BRP Info Tech, which takes the responsibility of collecting old electronics, and making it go through different stages of recycling methodology and ultimately dismantling it. There can be benefits, there can be numerous good side of recycling, but the ultimate’s reduction in pile of electronic waste. As, these wastes are becoming a global menace; and should not be taken lightly. In today’s world mobile phones usage are increasing day by day. So, is computer installation in offices are also all time high. Therefore, old phones, old computers, damaged electronic parts are piling up every day. Further, the advent of laptops and modern hand held devices have made computers replaceable in both government and private offices or work stations. So, it is making the situation more worst and increasing e-waste every day. Second, mobile phones are also not having life expectancy more than two years and further regular updates in mobile phones contributes further towards e-waste. So, overall the situation goes out of control as landfill is not sufficient, and it also damages the land by polluting it. So, recycling of waste is going to protect the atmosphere from land pollution, air pollution, and water pollution. It also gets the world free from millions of tons of e-scrap. 2.Conservation of Natural Resources: The conservation of nature should be the first priority of our human civilization. The best way is to stop extracting from earth, and recycle the old phones, computers, and other electronics items. They have more valuable metals in them and it is believed they are 4 times more than metal extracted from earth every year. Electronic items have metals like alloy, nickel, copper, zinc, stainless steel, bronze, etc. So, these metals can be extracted from the old electronics and reused again. They can also be helpful in bringing down the cost of the finished products. 3. Creating Local Jobs: Employment is a burning issue, and recycling of electronics can create a new industry. So, there will be generation of jobs for local youth and skilled laborers. 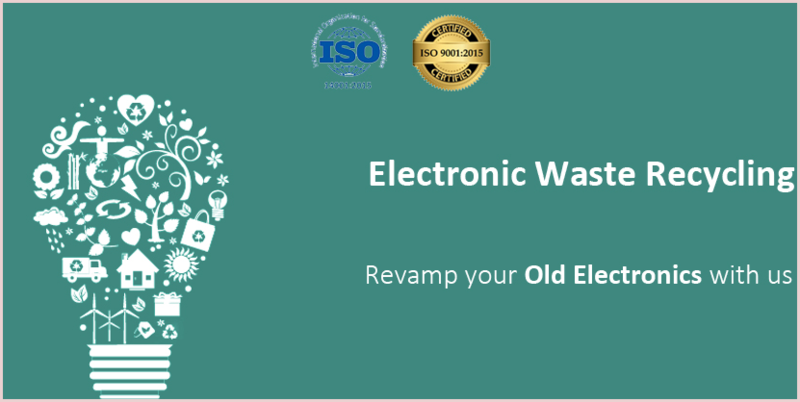 E-Waste recycling Bangalore is determining the need of man power and is removing the barriers between unemployment – employment. So, don’t think otherwise but contribute towards your society’s well-being by recycling old electronics.